The Marianas Visitors Authority leadership prepares to meet with their Guam counterparts in order to fortify collaboration and usher in benefit to the tourism sector of the islands. Chris Concepcion, MVA general manager and his deputy managing director, Judy Torres will be escorted by MVA board members led by Chairperson Gloria Cavanagh. 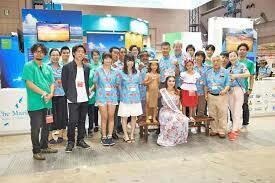 On February 23rd, the meeting has been scheduled in Guam. Concepcion explained that they would talk about regarding flight reductions, particularly in the Japan market. He explained that there are disputes that both MVA and the Guam Visitors Bureau share related to tourism sector. “We would like to work together and come up with strategies to promote both our islands,” he said. He further added as MVA considers Guam as a chief competitor, also it is CNMI’s partner and friend. Cavanagh, for her part, explained that they have same issues in terms of arriving tourists at the airport and their long waiting lines. “We can share information and challenges because we have similar issues,” she said. She mentioned that MVA simultaneously is interested to endorse the partnership in attracting visitors from Guam to Saipan and vice versa. Nevertheless, she stated that always there has been a restraint with the high cost of airfare. “Lots of people, including locals in Guam want to come to Saipan but tickets cost the same as they do going to Manila,” Cavanagh said. Concepcion explained after attending their meeting with GVB that they may also meet up with the tourism stakeholders in Palau.